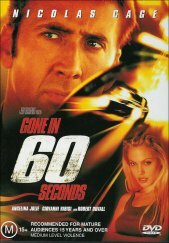 Gone in 60 Seconds stars Nicholas Cage, Angelina Jolie and quite a few other well known names and faces. It's the old story of an ex-con trying to live the straight life and then circumstances beyond his control force him back into the life for one last huge job. Nick Cage is that ex-con. His character's name is Memphis Raines. In this particular case, it's Memphis kid brother that bungles a high stakes car theft and his employer has threatened him with death unless Memphis can 'boost' 50 cars from a 'shopping list' within a four day period. It's too much for Memphis to do by himself so he calls in some favours and the old gang come together again to help the brothers out. The movie does nothing new, covers no new ground, nor does it even feature a lot of clever driving. However due to the sheer power of the assembled cast, Gone in 60 Seconds is rather mesmerising for some reason and will have you watching from start to finish. For car enthusiasts hoping to see a lot of nice vehicles you will be disappointed as most of the movies takes place at night. However there is a wonderful scene at the end of the movie involving a brilliant car chase and some high octane thrills. I won't ruin it for you, but those of you who have seen the movie should know immediately what I mean. The movie looks and sounds good however I did notice slight mpeg artefacts in some of the heavy black areas of the film. These are absolutely slight and barely noticeable. I've only really included this for you DVD tech heads out there. Gone in 60 Seconds is a very good movie that does belong in your collection even if it adds nothing new to the genre. It's thoroughly enjoyable, even though somewhat predictable.